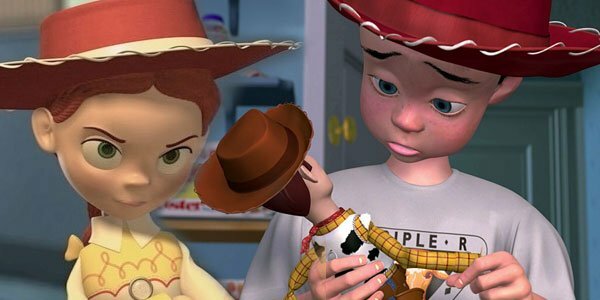 Toy Story Trivia: Is This Mystery About Andy's Mom Actually True? In 1995, Toy Story became a real game-changer. For one thing, it launched Pixar, an animation studio that has since established a reputation for being among the best in the world. For another, it raised the bar for computer animation, and for what audiences could expect from cartoons. Toy Story is a movie that still appeals to children and adults, and through its sequels it wove a story so complex and beautiful that fans are still mining it for Easter eggs and hidden gems. Well, a tip of the cowboy hat is owed to Jon Negroni, who composed the unifying Pixar theory. This time he thinks he has uncovered a curious subplot threaded through the Toy Story movies. And it all has to do with Andy's mother. Voiced by Laurie Metcalf, Andy's Mom (or Mrs. Davis as she is credited in the film) gets little screen time over the course of three movies. Mostly, she pops in to pick up toys or entreat Andy to clean up. Yet according to Negroni, there's much more to Mrs. Davis than meets the eye. You just have to follow the clues. You can read his argument in full on his blog, but the gist of it is this: Andy's Mom is Emily, the Emily who gave up Jesse the cowgirl years before, leaving the doll bitter and heartbroken. Negroni's theory boils down to two key visual clues. The first of which is the cowboy hat Andy sports in the first Toy Story. Notably, it does not look like Woody's. It's red, where Woody's is brown. Plus Andy's has a white trim that closely resembles Jesse's signature chapeau. Negroni even points out that the white ribbon on Jesse's hat seems to have fallen off of Andy's. Note the wear where a ribbon could have been? From there, he posits out that the hat seen on Emily's bed in the scene above is the very same hat that Andy wears while playing with Woody. He argues Andy's Mom gave it to him. The second visual cue comes down to Mrs. Davis's haircut. Essentially, Negroni argues that it is the same as Emily's when she leaves Jesse behind. He recognizes that Emily seems to have been a redhead, but dismisses this hair color shift as a quirk of aging. Personally, while I find the hat point intriguing, this one seems a stretch. If Pixar intended audiences to pick up clues of Mrs. Davis's identity as Emily, you'd think they'd have made the hair similarity stronger in color and cut. After all, these are storytellers who are known for taking their Easter eggs seriously. Emily from Toy Story 2, Mrs. Davis from Toy Story 1, 2 & 3. This theory also assumes that Jesse wouldn't recognize Andy's mom as Emily. Maybe that's possible as the rules for this in the Toy Story movies are unclear. For instance, Woody is clearly a plaything that is out of the 1950s, but he's only been with '90s-kid Andy since kindergarten. Yet he recalls nothing of a life before Andy. Buzz Lightyear had no recollection of his life before he left his box, and can't recount what happened when his switch was clicked to Demo, then Spanish mode. Lotso and Jesse vividly recall being abandoned by their owners. But neither experiences owner amnesia when they get a new one. So how does toy memory work? We know from the movies that Woody is "an old family toy," as his Mom tells a pestering Al of Al's Toy Barn in Toy Story 2. But is Jesse's cowboy hat as well? And if so, does this mean that Andy's mom not only owned a Jesse doll, but also that very doll fatefully came back into her sphere to be passed down to her son? It's a romantic thought that Negorni points out would make the Emily/Jesse story "come full circle." But does it make sense? If I had $1 for every tweet I got today asking about Andy’s mom, I’d have more money than I had yesterday. What does that even mean? Weigh in with your thoughts below. Is Andys Mom the Emily who gave away Jessie? No, but it's a nice idea. Yes! Look at the hat and the hair!